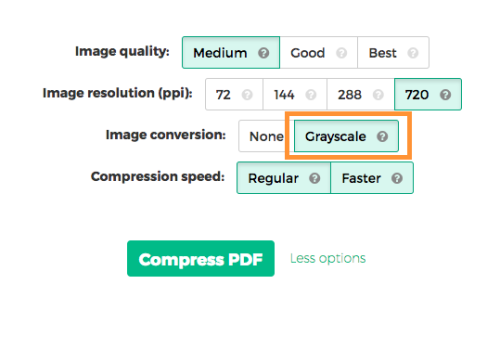 We’ve updated our Compress PDF tool with two more options that you might find useful. When we’re compressing a PDF document most of the times the dramatic reduction in file size comes from optimising the images inside. Most of the times this is done by scaling down high resolution images to a lower yet reasonable quality. This is interesting for scenarios where your PDF document contains high resolution images (eg: 720 ppi), like an architecture portfolio for example. You’d like to keep these images in their high resolution, but still compress the PDF document if possible. There’s now a new option that, when selected, will make sure the images don’t lose their high resolution. We hope you’ll find these new options handy. As always, love to hear your thoughts about this in the comments below. We’ve all been there: filling an online application form, having to supply documents along with the application form. The constraints are usually that a single file is uploaded containing all the personal details: the filled in forms, the supporting scanned documents, everything. Usually there’s also a file size limit of 5Mb. We’ll talk about how to do this as easy as possible. First, let’s break down the steps that are usually required. You can fill forms using Adobe’s Reader or Sejda’s PDF Editor. For best result one would should use a scanner. Most printers these days have a scan function built-in. But what if you don’t have a printer around you. No problem, you can use your mobile phone’s camera to scan your documents. Place the documents on a table, white background works best, and take a picture of each page from right above it, making sure there’s plenty of light and the document is properly visible in the result. So now we have a filled out form, in PDF format, and a few scanned documents, all images. One cumbersome way to merge them all is to first convert all scanned images to a PDF document, and then to merge the PDFs into a single file. Sejda’s PDF Merge accepts both images and PDF files and will do the conversion automatically, so it’s simpler. We now have a single PDF file, but it’s 20MB in size and the online application page won’t accept it. We can compress the PDF file so all the scanned images inside will be optimised to be smaller yet keep a good quality. Ok, now the merged file has shrinked dramatically in size and we can upload it and complete the online application. Whew, that was a lot of work! Scanning, merging, compressing, a lot of steps and sometimes it can be technically challenging. It seemed there should be a better way. So we built a better way. Scan documents with your mobile’s camera. We’ll compress the images so your merged PDF is super tiny in size and can be uploaded to your online application. Your files stay private and are automatically deleted after being processed. We hope this will dramatically help everybody that’s preparing documents for an online application form. Love to hear your feedback on this in the comments below. And success with your online application form! This post was also posted on Medium.